Episodes are listed here by US airdates. French airdates put the episodes in a slightly different order, and the corresponding episode numbers are listed in brackets. FR: 2014-11-19 In order to keep Tails out of harm's way, Sonic fires him and auditions for a new sidekick. "Can an Evil Genius Crash on Your Couch for a Few Weeks?" FR: 2014-11-19 Dr. Eggman moves in with Sonic and Tails while his fortress is repaired. FR: 2014-11-19 Tails builds a robot that vocalises everyone's thoughts, leading to friction between the group. FR: 2014-11-22 Sticks is accused of being unkind to animals, so she gets a pet robot named Buster. FR: 2014-11-19 Sticks is invited to a formal occasion, and must learn how to behave with etiquette. FR: 2014-11-22 Dr. Eggman enlists Amy to help him get his lair on the front cover of a magazine. FR: 2014-12-10 Dr. Eggman takes on an unpaid intern, Dave, who activates a doomsday device. FR: 2014-12-10 Dr. Eggman anonymously gives Sonic cookies intended to turn him evil, but Sonic's friends eat them instead. FR: 2014-12-17 After Sonic and Tails save a village from bandits, the villagers constantly guilt-trip them into staying. FR: 2014-12-17 Orbot and Cubot awaken to find that Eggman has gone missing, so they ask around for his whereabouts. FR: 2014-12-24 When Tails messes around with one of Eggman's robots, he accidentally reprograms it. Sonic and Tails must protect Eggman from his own creation. FR: 2014-12-24 When Sonic and the gang are forced to join T.W. Barker's traveling circus, it's up to Tails to step up and save the day. FR: 2015-01-14 Annoyed that Sonic always seems to have luck on his side, Knuckles attempts to get rid of his own bad fortune by repeatedly risking his life. FR: 2015-01-21 A meteor with mysterious powers causes Sonic and Dr. Eggman to exchange bodies. Now, Sonic has to find a way to switch back. FR: 2015-01-14 When Dr. Eggman loses his mojo, he enlists the help of a motivational speaker to help him become capable of making a decision on his own (so he can get back to his dastardly ways). "How to Succeed in Evil Without Really Trying"
FR: 2015-01-21 After Tails accidentally destroys a forest, a secret organization dedicated to random acts of evil tries to persuade him to join. FR: 2015-02-11 Dr. Eggman claims he was injured while battling Sonic and takes his blue-hued nemesis to court in hopes of receiving justice. FR: 2015-02-11 Dr. Eggman becomes a celebrity chef thanks to his delicious tomato sauce. But Sonic can't shake his suspicions that something's just not right. FR: 2015-02-18 Every time Sonic runs, he leaves a deafening sound in his wake. To find a cure, he'll need help from an unexpected source. FR: 2015-02-18 When Dr. Eggman relives the same day over and over again, he asks Sonic to help him find a way out of the miserable time loop. FR: 2015-03-11 While enjoying some free time, Sonic, Knuckles and Tails accidentally awaken a huge rock giant that proceeds to run amok. "The Curse of Buddy Buddy Temple"
FR: 2015-03-11 When Sonic and Dr. Eggman get trapped in an ancient temple, they must put their differences aside and work as a team in order to escape. FR: 2015-04-01 After a vicious computer virus hijacks Dr. Eggman's nefarious technology, Orbot and Cubot enter cyberspace in an attempt to get it back. FR: 2015-04-01 Sonic encounters one obstacle after another when he races to return a book to the library before he must pay the dreaded late fee. FR: 2015-04-01 When Sticks decides to teach Amy how to best survive in the wild, Sonic and Knuckles try to make a game of it. 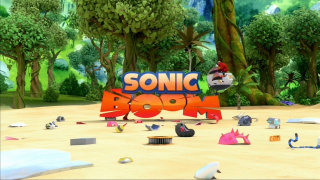 FR: 2015-04-08 Dr. Eggman quits technology, but when the village is attacked by outside forces, Sonic and the gang need Eggman's lair up and running, pronto. FR: 2015-04-08 Fed up with the yucky food at Meh Burger, Amy opens a restaurant of her own and soon finds herself in a war for customers. FR: 2015-04-08 When a super cool new shrew arrives and impresses everyone, Sonic worries that his days as the town's biggest hero are numbered. "Curse of the Cross Eyed Moose"
FR: 2015-04-22 Sticks worries that she and her friends may be cursed after they cross paths with a cross-eyed moose. FR: 2015-04-22 Knuckles gets more than he bargained for when he sets out to track down rare peppers that will help him win the Chili Dog Cook-Off. FR: 2015-05-06 After discovering that Sticks is a bit of a pack rat, Amy insists that she should have a yard sale to get rid of her junk. FR: 2015-05-06 Mayor Fink appoints Knuckles to be the village's mayor for the day. Turns out, not everybody's got what it takes to be a public servant. FR: 2015-05-20 When Dr. Eggman sets out to make a movie about his own rise to power, he and Sonic have more than a few creative differences on the set. FR: 2015-05-20 Sonic gets some much-needed sensitivity training after referring to Mike the Ox as "just a guy" incapable of battling Dr. Eggman. "Two Good to Be True"
FR: 2015-06-03 Chaos ensues when a Knuckles look-alike from another dimension appears and the gang begins searching for a way to send him back home. "Beyond the Valley of the Cubots"
FR: 2015-08-29 After they find discarded Cubot prototypes hiding out in the jungle, Cubot and Orbot turn to Sonic and Tails to protect them from Dr. Eggman. FR: 2015-08-29 When Dave the Intern shows off to his mom, he accidentally captures Dr. Eggman. Suddenly, there's a new evil mastermind in town. FR: 2015-06-03 As the year comes to a close, everyone's happy except Dr. Eggman, who still wants time to complete his old resolution: defeating Sonic. "Battle of the Boy Bands"
FR: 2015-08-29 Sonic, Tails and Knuckles disguise themselves as members of a boy band to prove that Sticks and Amy are being brainwashed by Justin Beaver. FR: 2015-08-29 When Tails confesses that he has a crush on Zooey, the gang offers him some not-so-great advice on acting smooth. FR: 2015-08-30 After Sonic and Knuckles accidentally destroy Amy's couch, they compete on a game show in hopes of winning her a new one. FR: 2015-08-30 Knuckles is tapped to replace Comedy Chimp, but the host has plans to win back his old show -- and they involve a certain egg-shaped evil genius. "Fire in a Crowded Workshop"
FR: 2015-08-30 After a fire destroys Tails’ workshop, Sonic and the gang have very different recollections of what happened. "It Wasn't Me, It Was the One-Armed Hedgehog"
FR: 2015-08-30 Things around the village are disappearing -- including Dr. Eggman's particle accelerator -- and all the evidence suggests that Sonic is the thief. FR: 2015-08-31 Determined to prove that he can invent stuff just as well as Tails, Knuckles enters a Robot Battle Royale contest. FR: 2015-08-30 After Dr. Eggman installs solar panels without a permit, the homeowner's association threatens to evict him from his evil lair. FR: 2015-08-31 Sonic becomes suspicious when Amy forms a connection with Dr. Eggman over a shared interest in the tabletop battle game Fuzzy Puppies. FR: 2015-09-06 Dr. Eggman's got something up his sleeve when he challenges the members of Team Sonic to fight him individually rather than together. FR: 2015-09-05 After Sonic and the gang are declared honorary role models by the mayor, they find that their new titles are getting in the way of their work. FR: 2015-08-31 When a storm forces the gang to take shelter at Amy's, they discover she's written a not-so-flattering play based on her friends. FR: 2015-09-20 Inspired by a new self-help book, Knuckles tries to fix mistakes from his past. Unfortunately, things don't exactly go as planned. FR: 2015-09-20 Realizing that he can't hope to topple Sonic by himself, Dr. Eggman calls on Shadow the Hedgehog to help him finish the fight. FR: 2017-04-08 Sonic lets martial arts action movie star Tommy Thunder follow him around and observe his "hero process" for Tommy's upcoming role. However, things erupt when Tommy's over-the-top ego clashes with Sonic's and he starts to claim credit for the gang's victories. FR: 2017-04-08 Eggman discovers that an asteroid is on a collision course with the planet! It's up to Sonic and his friends to destroy the asteroid. FR: 2017-04-08 Sticks is fed up that all the news is fluff, so with Tails' help, she creates a podcast to speak truth to power. It becomes so popular that the TV news producer decides to fire Soar and replace him with Sticks. But in order to report the truth, Sticks is pressured into toeing the company line. FR: 2017-04-08 Sonic and Tails are working on an invention to make Sonic even faster. Unfortunately, Sonic goes so fast that he eventually disappears. Tails is nervous. Did he disintegrate Sonic? Meanwhile, Sonic is alone in another plane of existence where he can only see ghostly images of his friends but can't communicate with them. When Eggman decides to attack, the gang battles him while protecting Tails so he can work on a solution. FR: 2017-04-08 Sonic is pestered by Mark the Tapir, who weasels his way into a position as Sonic's assistant. Eventually, Mark crosses the line and captures Sonic and his friends. "Anything You Can Do, I Can Do Worse-er"
FR: 2017-04-08 Eggman challenges Tails to prove he is a genius by capturing Sonic. "I Can Sea Sonic's Fear From Here"
FR: 2017-04-08 After a particularly harsh defeat, Eggman comes to the conclusion that he never wins against Sonic because he is always facing him on favorable ground. So Eggman concocts a plan to have Sonic fight him underwater. Motivational speaker Soar the Eagle will have to use all his coaching talents to help Sonic overcome his phobia of the water in order to defeat Eggman. FR: 2017-04-08 Sticks discovers Dreamcaster, a mysterious figure trying to hypnotize the village in the middle of the night. The gang doesn't believe Sticks, telling her Dreamcaster isn't real and her paranoia is out of control. FR: 2017-04-08 Tails takes a failure during a battle with Eggman to heart. He feels that even though he's the smart one in the group, he's just not smart enough to help Sonic and the gang. So he creates a machine to duplicate himself and form a "brain trust." But will he and his duplicates be smart enough to defeat anything that Eggman can come up with? FR: 2017-04-08 After a very humiliating defeat at the hands of Sonic and the gang, Eggman returns to his lair and takes out his frustrations on Orbot and Cubot. The robot duo has finally had enough! Down tools! They're going on strike! FR: 2017-04-08 The good people of the Unnamed Village feel that things have gotten pretty lawless. They figure there's not a lot they can do to stop evil, so they license, regulate, and tax it. Eggman fails the evil test and must wait 90 days to do evil, so Eggman decides to use Orbot as his front. Orbot will get an evil license and Eggman will be the puppet master. But Orbot's ego gets out of control and Eggman must get Sonic's help to defeat The Evil Dr. Orbot. FR: 2017-04-08 During a fight against Eggman, Knuckles suffers amnesia. His friends try to help, reminding him of his worst blunders via flashbacks. But he becomes more depressed when he learns that he is the last of his kind - the final echidna. Feeling all alone in the world, Knuckles sets out to find a foster family among the Villagers who might be willing to take him in. FR: 2017-04-08 Sonic stumbles upon an ancient mech suit. It makes him more powerful, but soon Sonic becomes dependent on it, and it starts to change his personality. FR: 2017-04-08 Eggman builds a giant new robot to defeat Sonic. He programs it to know everything about the Blue Blur, but things don't go as planned - with all FiendBot's knowledge of Sonic, it doesn't want to destroy him, it wants to be his friend. FR: 2017-04-08 The gang becomes suspicious when Froglodyte Og comes to the surface world. They fear their suspicions may be correct when a Froglodyte army arrives in The Village. FR: 2017-04-09 Knuckles is upset when he wins a lamp in a raffle and it dawns on him that he doesn't have a home in which to keep it. He sets out to rectify the problem by getting a job. FR: 2017-04-09 When the Village's power source, the Meroke Chrystal, stops functioning, the gang must go in search of a replacement. They need to solve a series of puzzles in a trap that was built by the ancients to get it. FR: 2017-04-09 When the people of the Unnamed Village find out that their village used to be called "Badgerville" after Sticks' evil ancestor, anti-badger sentiment runs rampant. They decide to rename the town to something more agreeable, and an election is held between Eggman and Amy. FR: 2017-04-09 Dr. Eggman creates a new line of automated robot workers for Meh Burger. Dave loses his job, being lazy and entitled, and Sticks flees, fearing the "tin death chefs." When Dave joins forces with the Lightning Bolt Society to win back his job, we soon discover that Eggman has evil ulterior motives. This time, Sticks might have been right, and it's up to her to save the entire village. FR: 2017-04-09 Amy nurses one of Dr. Eggman’s beebots back to health and adopts it as a pet. FR: 2017-05-01 Feeling the need for unconditional love, Eggman creates "Mombot." Unfortunately, she's overly critical of everything he does and she's constantly embarrassing him in front of Sonic. FR: 2017-05-01 Tails sets out to prove that the mythical creature Muckfoot is real. FR: 2017-04-09 Eggman’s nemesis Nominatus is back. With the help of his two virus minions he tries to take over the world… from outside the computer! FR: 2017-04-09 Steve Eggman comes to town, claiming to be Eggman's long lost brother. He wants to fight for good alongside Sonic and the gang. FR: 2017-05-01 An endangered species wanders into Sonic's shack. He can't move the ugly, smelly animal because of a series of government regulations. FR: 2017-04-09 Mighton and Bolts, two robots from a city in the clouds, think Sonic and the gang are villains because they destroy robots. "Robots From The Sky Part 2"
FR: 2017-04-09 Robots all over the planet have turned evil. Sonic & Tails travel to the city in the clouds to get help curing the infected robots. "Robots From The Sky Part 3"
FR: 2017-04-09 Sonic and Tails discover that the city in the clouds has been taken over by evil robots, and it might all be Tails’ fault! FR: 2017-04-09 Hypnobot teams up with Dr. Eggman to take over the world, while the entire gang is overwhelmed by hordes of hypnotized, evil robots. FR: 2017-04-23 The gang learns that sometimes the fiercest things come in the smallest packages when Eggman attacks with his tiniest robot yet. FR: 2017-04-23 The Lightning Bolts threaten to steal Sonic and the gang’s’ fan base after an intense bowling match. FR: 2017-09-03 The guys are stoked to find out their band, Dude-itude, has booked its first road gig so they hit the road in their new decked-out van. FR: 2017-09-03 With the guys' band away for a gig Amy & Sticks have a girls' weekend. When Belinda hears half the gang is gone, she plans an attack. FR: 2017-04-18 Eggman can't pay the tax bill for his trash pickup, so to raise the necessary funds, he must turn his evil lair into a luxury resort. FR: 2017-09-03 When it’s revealed that Dr. Eggman is not actually a doctor, he becomes a joke and must go back to school to finish his Ph.D. in evil. FR: 2017-09-03 Thinking his lair is haunted, Eggman sells it to Barker. Sonic and Tails must prove ghosts aren't real. "Return of the Buddy Buddy Temple of Doom"
FR: 2017-09-02 Unable to use his robots, Eggman employs the Froglodytes to force Gogobas to mine for a crystal that will power his giant new Mech Suit. FR: 2017-09-03 Eggman’s anti-gravity ray causes chaos in Hedgehog Village. With newfound confidence, Cubot tries to bring enlightenment to the villagers. FR: 2017-09-28 Sonic challenges Eggman to a game of soccer in order to save the Village's beloved rec center. "Three Men And My Baby!" FR: 2017-09-26 When Tails, Knuckles, and Sonic accidentally injure Lady Walrus they agree to take care of her baby, Chumley. "Where Have All The Sonics Gone?" FR: 2017-09-25 Morpho sends Sonic to a dimension where he never existed. Sonic must unite his gang and help take back the alternate dimension village. "If You Build It They Will Race"
FR: 2017-09-15 The gang becomes very competitive with one another when they enter an auto race, using cars they've designed themselves. FR: 2017-09-27 Sonic agrees to be Dr. Eggman’s friend on social media - a kindness he will surely regret. FR: 2017-09-19 Amy's hammer is missing and she is lost without it. Vector the Crocodile is on the case. FR: 2017-04-18 Sonic becomes a delivery boy for Meh Burger, guaranteeing he'll make all deliveries in under 3 minutes, but Dr. Eggman gets in the way. FR: 2017-09-22 After accidentally triggering lockdown protocol during a battle, the gang gets trapped in Eggman's lair with Eggman, Cubot and Orbot. "You and I Bee-come One"
FR: 2017-09-25 Tails tests his new teleportation device on himself and accidentally merges with a Beebot. Sonic must find a way to reverse the process. FR: 2017-09-22 As a result of an experiment gone wrong, Eggman turns into an adorable little creature every time he gets angry. FR: 2017-10-04 Dr. Eggman and Steve turn a family vacation in Roboken into an opportunity for evil. Mighton & Bolts enlist the help of Sonic & friends. "Return to Beyond the Valley of the Cubots"
FR: 2017-10-04 When Tails gives D-Fekt the ability to speak, the little robot joins with the Cubot rejects to take down their nemesis, Dr. Eggman. "Eggman: The Video Game Part 1"
FR: 2017-09-29 When Eggman tries to recruit Shadow to help him bring more evil to his video game, it has dangerous consequences for Sonic and his friends. "Eggman: The Video Game Part 2: The End of the World"
FR: 2017-09-29 Sonic and friends must face their most dangerous foes in order to prevent a disaster that is going to destroy the universe.